Perfect for a Sunday roast- leg of lamb adorned with rosemary and served with a savoury red wine sauce. Serve with green beans and roasted potatoes. 1 Preheat oven to 425° F (220° C). Break off eight 1-in (2.5 cm) pieces from rosemary sprigs; set aside. Set aside 8 garlic halves. Arrange onion, remaining rosemary and garlic in roasting pan, then top with lamb fat side up. Make eight 1-in (2.5 cm) deep cuts in lamb; stuff cuts with reserved garlic and rosemary. 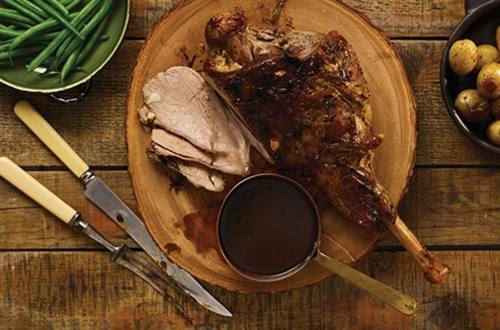 Season lamb with black pepper and rub with Knorr® Bovril® Liquid Chicken Bouillon. Roast 30 minutes. 2 Reduce oven temperature to 350° F (180° C) and roast an additional 1 hour 10 minutes or until meat thermometer reaches 145°F (63°C) for medium rare. Remove lamb to serving platter and keep warm. 3 Remove rosemary sprigs from pan and discard. Skim fat from pan drippings. Add wine and cook over medium heat, stirring occasionally, 5 minutes or until reduced slightly. Strain and return to pan. Combine flour and water in small cup; stir into pan and cook over medium heat, stirring constantly, until slightly thickened, about 2 minutes. Serve gravy with sliced lamb.